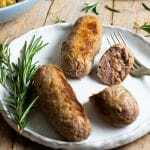 How to make juicy and delicious homemade sausage bursting with classic Italian flavours from fennel seeds, garlic, and red wine. These sausages can be made easily at home without any casings, skins or machine. Serve with polenta, a rich tomato sauce or with lentils for a classic Italian meal. Blitz the diced pork shoulder in a food processor for 30-60 seconds. You might need to do this in two batches depending on how powerful your processor is. It should be fine with chunks of fat. Next add the minced garlic, herbs and salt and pepper. Make sure to use fresh rosemary and chop it very fine, dried rosemary doesn't have as strong a flavour. Pour over the red wine and mix everything together until thoroughly combined using your hands. If you see any sinew, long stretchy pieces of fat then remove it (see photo 6). There shouldn't be much at all. Cover with cling film and let the meat marinate for at least 30 minutes if possible. Separate the pork sausage meat into 8 even portions then shape into a rough sausage shape. Lay out a small sheet of cling film and place the sausage meat at one of the widest edges. Roll it tightly without too much force and twist and tie the edges. Bring a pot of water to a boil and turn off the heat. Add the sausages to the hot water for around 30 seconds so they firm up and keep their shape. Place on a plate and cut the edges to remove from the cling film. You can now let them cool and place in the fridge until you need them or fry them in a little olive oil in a large pan until browned on all sides and cooked through for around 10 minutes.